Apparently, he's NOT a bald man wearing lettuce leaves as the e-fit would lead you to believe. This is apparently a problem with the "hair" functionality of their e-fit programme. 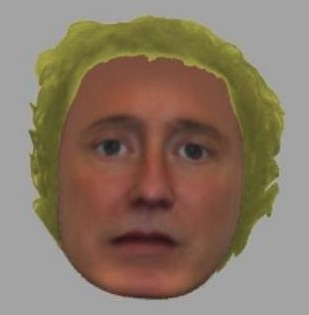 Indeed it's a problem with their e-fit programme: the face is drawn by a computer and the hair is filled in later by a 5 year old with crayons.